Apple on Monday released a trio of new video ads in its "Switch" series, aimed at persuading Android users to make the leap to an iPhone. The first, "Security," argues that Android devices are more vulnerable to data theft, while "Smooth" implies that iPhones offer inherently better performance, regardless of a device's specifications. "Contacts" is the only one of the three that avoids going on the attack, simply suggesting that it's easy to migrate contact data to iOS. 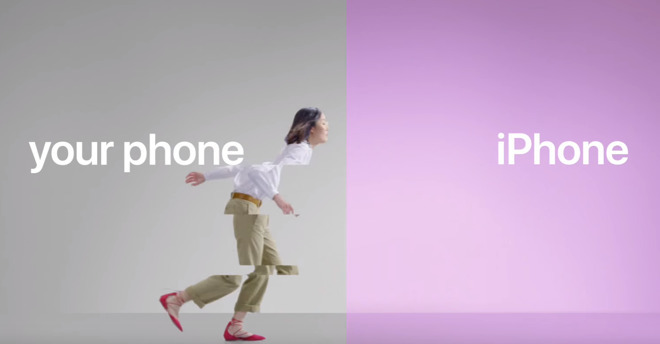 As with the first round of "Switch" ads, released last week, the new ones all use a left-to-right motif and direct people to apple.com/switch. That site was recently revamped to expand its focus beyond the Move to iOS Android app and sell people on the merits of iPhones, such as a high-quality camera, better technical support, and a lower environmental footprint. Apple has often bragged about the number of people switching to iPhones, but added the caveat "outside of Greater China" to record-breaking claims in its last quarterly results call. In that country the company has largely been trounced by native Android brands Huawei, Oppo, Vivo, and Xiaomi, ending up in fifth place.